In the early 19th century, the British economist David Ricardo said central banks should never in the “slightest degree” fall under government control. Today many of the biggest central banks are operating closer to his ideal than ever before. Central bankers around the world — from the US Federal Reserve and the European Central Bank to the Bank of England — are exercising power and independence that their predecessors would have struggled to achieve. Since the global financial crisis they have brandished new tools, such as the ability to purchase trillions in assets to prop up their economies, while acquiring deeper regulatory responsibilities over banks and markets. These freedoms have opened central bankers up to new criticisms, including claims they are hubristically attempting to tame the business cycle while storing up threats of bigger crashes down the road. Their crisis-fighting interventions have also propelled these unelected technocrats into politically charged debates over income distribution and inequality. And they have left them operating on the perilous boundary between monetary policy and budgetary policy following the purchase of vast amounts of government bonds in “quantitative easing” schemes. The political mood surrounding central banks has accordingly become rancorous. In the US, the rightwing of the Republican party has turned the Fed into a whipping boy, with Ted Cruz, who is seeking his party’s nomination to run for presidential candidate, last month accusing the Fed of “juicing” the economy with low interest rates. He argues in favour of tougher Congressional oversight and a return to the gold standard. In the eurozone, the ECB has come under fire for its involvement, alongside the International Monetary Fund and the European Commission, in the troika of institutions handling the bailouts of Greece, Portugal and other weaker EU members. And in Britain, Mark Carney, governor of the BoE, has been accused of over-reach for his speeches on sensitive topics such as climate change and Britain’s membership of the EU, which he believes were consistent with the BoE’s remit. Ricardo’s ideal of central bank independence — the ability for a central bank to set monetary policy without interference — has taken hold only in recent decades. The attractions are clear. Keeping interest rate-setting at arm’s length from politics, rates are set in the name of low and stable inflation, not short-term political convenience. Until the crisis, it looked like they had hit on a magic formula. For much of the 1990s and 2000s leading economies enjoyed low and stable inflation, along with relatively steady growth in an era known as the Great Moderation. Those conditions turned out to be a chimera. In the 2000s, most central bankers failed to highlight — or even acknowledge — the risks building up in the banking system, an omission that had disastrous consequences when a financial collapse triggered the world’s worst post 1945 recession. Yet ironically, central banks emerged from the crisis more powerful than ever. The question being asked on both the left and right is whether central banks’ policy fiefdoms have become too expansive. Many say the monetary authorities should concentrate on their core task — keeping inflation on target — an objective they are struggling to meet. Several central bank watchers believe the very notion of independence needs to be updated in light of the tools the monetary authorities have acquired. In the US, the Fed faces a barrage of legislative challenges to its independence from Congress, where many lawmakers are troubled by its multi-trillion dollar crisis-era interventions. The proposals range from enhanced reporting requirements to more significant constraints on how the Fed conducts monetary policy and emergency lending. That scepticism has been reflected in Congress, where lawmakers have found that railing against the Fed is popular with their constituents. In 2013, the number of new congressional bills seeking to constrain the Fed outnumbered those empowering it by 45, a record margin, according to research by Sarah Binder and Mark Spindel in a forthcoming book on Congress and policy making. In the eurozone, the structure of the ECB has left it exposed to an onslaught of criticism from politicians and protesters who accuse it of being undemocratic and unaccountable in its handling of the sovereign debt crisis. This April a 21-year-old student working under the moniker Josephine Witt doused Mario Draghi, ECB president, in confetti in protest at its handling of the Greek crisis. Mr Draghi is adamant that rules, not politics, have dictated its approach to Greece and other member states. The German political and economic establishment, including Chancellor Angela Merkel, has railed against some of the ECB’s policies, especially when — like the €1.1tn quantitative easing programme — they have involved buying other governments’ bonds. The rise of populist parties, from Italy’s Five Star Movement to Syriza in Greece, has also increased criticism of the ECB. In Britain the BoE’s cherished independence came under pressure during the recent Labour party leadership election, with Jeremy Corbyn, who won the contest, advocating that the central bank should be forced to fund government infrastructure — a policy called “people’s QE”. John McDonnell, shadow chancellor, has since stated that central bank independence is “sacrosanct”. However, he has put together a group of experts, led by former BoE rate-setter Danny Blanchflower, to reconsider the mandate of the MPC, which primarily targets inflation. Last week Stanley Fischer, the Fed’s vice-chairman, set forth his most detailed defence of monetary policy independence since he joined the central bank, warning that new fetters from politicians would be dangerous when inflation is quiescent. He acknowledged the independence debate is being complicated by new financial stability goals on top of inflation targeting, and that it can be appropriate to have political involvement in stability issues such as property booms. The legislative challenge that most worries Fed officials is a bill backed by Elizabeth Warren, a Democratic senator, and David Vitter, her Republican counterpart, to further limit the Fed’s ability to give emergency loans in a crisis and stop “backdoor bailouts” to failing banks. Simon Johnson, a professor at MIT Sloan School of Management, draws a distinction between attempts to rein in the Fed’s discretion on monetary policy and possible reforms to its financial stability operations. Attempts by some Republicans to “clip the Fed’s wings on monetary policy” were a bad idea, he says. However, matters were different on the emergency lending side, where he argues there was insufficient clarity in the Fed’s own rules on interventions. Last year, the BoE, which had come under attack for its handling of the crisis, sought to brush off its reputation for secrecy. The measures, which include publishing the minutes of MPC meetings alongside the decision instead of two weeks later, have been broadly welcomed. But critics fear that these plans do not go far enough, as they restrict the role official auditors would play in scrutinising the effectiveness of the BoE’s operations, for example. The other area where central banks face pressure to display greater transparency is over their ties with the financial industry. The BoE has come under fire for allowing its newest rate-setter, Gertjan Vlieghe, to retain a passive stake in his former employer, Brevan Howard, a hedge fund that bets on the direction of interest rates. He has since cut his ties with Brevan, but lawmakers asked the BoE to review its code of conduct. The ECB’s executive board is facing scrutiny after one member, Benoît Cœuré, detailed plans to front-load some bond purchases to a private gathering of hedge fund managers, bankers and academics. Because of what the ECB dubbed an “internal procedural error”, the remarks did not appear on its website until the morning after the talk. The ECB has since set out guidelines forbidding board members from making sensitive remarks at events unless these statements are immediately available to the public. The board’s diaries, details of which were revealed by the FT last week after a freedom of information request, showed that several members had met bankers and asset managers days before — and in one case hours before — major policy decisions. The ECB says it will begin publishing the diaries of executive board members with a three-month lag. Beefing up the rules on accountability could go a long way towards ensuring that the public continues to trust central banks even as they assume new powers, critics say. Central bankers are already subject to extensive political scrutiny — for example in parliamentary hearings — but this may need to be broadened. “Central banks have become supremely powerful and if power corrupts, absolute power corrupts absolutely. We need to be more innovative in designing accountability,” says Rosa Lastra, a professor of monetary law at Queen Mary University in London. “There is a danger of central bankers talking too much,” says Lucrezia Reichlin, an economist at London Business School and a former ECB official. - Gold sinks -- it doesn't float. - Stan the man is buying dollars. - Divergences and the Fed continue to say sell. - Technical action and follow through means new lows. - Triple-digit gold coming soon. The price of gold fell by 4.83% in the third quarter of 2015 and was down 5.82% as of September 30. Then a big rally took the price up to highs of $1191.70 by October 15. Long-term resistance at $1234, the May 18 highs, was in sight and was an important target for the bulls. Gold looked precious as it rallied. Open interest, the total number of long and short positions in COMEX gold futures, rose along with the price. On September 30, the metric stood at 417,079 contracts; by October 15, it had risen to almost 460,000. The rise in open interest of 10.3% accompanied a price increase of 6.9%. Rising price and open interest is generally a bullish technical sign for a market. It means that higher price is attracting more buying. 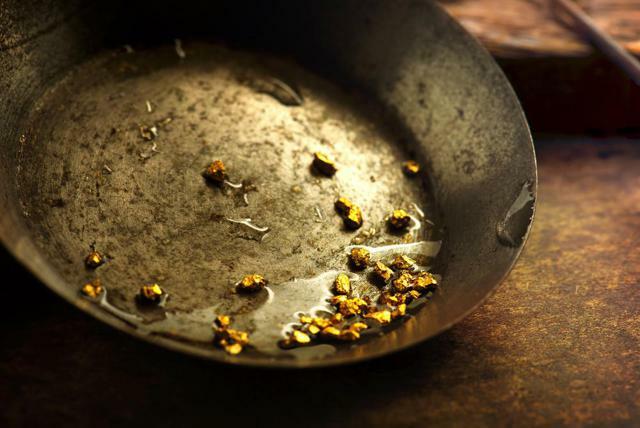 However, as gold approached the key psychological level of $1200 per ounce, it ran out of steam. It took gold two weeks to rise by almost 7%; during the three weeks that followed, it sunk. On Friday, November 6, active month December gold futures traded on COMEX closed at $1088 per ounce, down 8.7% from the October highs and down 2.4% from the close on September 30. 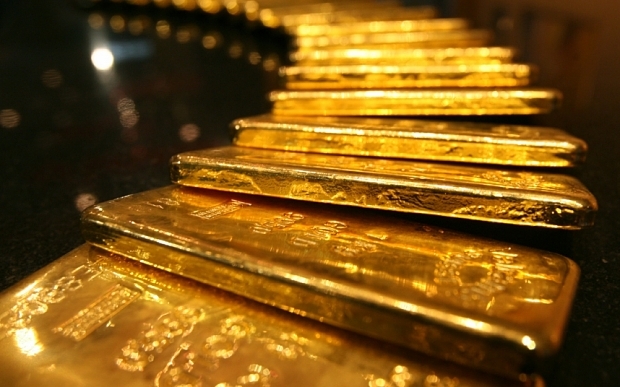 There are many reasons that gold ran out of steam. A lot of the buying in the gold market at the beginning of the fourth quarter was due to uncertainties surrounding global markets. As other markets stabilized, the fear factor dissipated. At their September meeting, the U.S. Federal Reserve opted not to raise interest rates, which helped propel the yellow metal higher. However, improving U.S. economic data over recent weeks has strengthened the case for interest rate liftoff at the Fed's upcoming December meeting. Moreover, weak economic conditions in Europe and other areas in the world have caused the dollar to rally aggressively over recent weeks. When gold reached its highs on October 15, the dollar traded to lows of 93.83 on the active month December dollar index futures contract. The weakness in gold has been due, in large part, to a huge rally in the dollar, which took it from those lows to highs of 99.47. The dollar index closed on Friday at 99.26 -- an increase of 6% in three weeks, which is a huge move for a currency. Late last summer, Stan Druckenmiller the infamous hedge fund manager and ex-partner of George Soros, stated that he was one of the largest holders of SPDR Gold Shares ETF (NYSEARCA:GLD). While GLD gave Stan some love during the first weeks of October, that love turned sour as gold fell below the $1100 level once again last Friday. However, it appears that Druckenmiller is hedging his big bet in gold by buying dollars. An article on Bloomberg on November 3 quoted the hedge fund manager as saying there is a divergence between the monetary policies between the U.S. and Europe. He said that ECB President Mario Draghi has "pretty much signaled step two," which is further interest rate cuts and quantitative easing to stimulate the lethargic European economy. He went on to say that there is "heavy breathing" at the U.S. Fed, who is preparing to raise interest rates. This implies that Stan is now long gold and short euro against the dollar. This makes him long gold in euros, a bet that the price of gold in euros will move higher. However, this has not been the case over recent sessions as the price of gold has dropped faster than the euro. The daily chart of gold in euros shows that it has dropped from around 1078 euros per ounce on October 27 to 1012.50 last Friday. It is possible that Stan is hedging his big gold bet with a long dollar position. 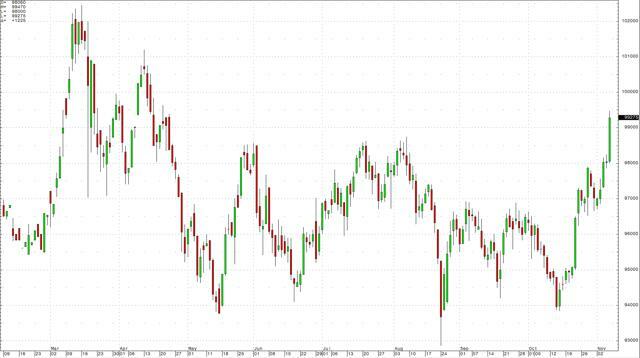 I whole-heartedly agree with Druckenmiller's opinion that the euro is going lower versus the dollar. 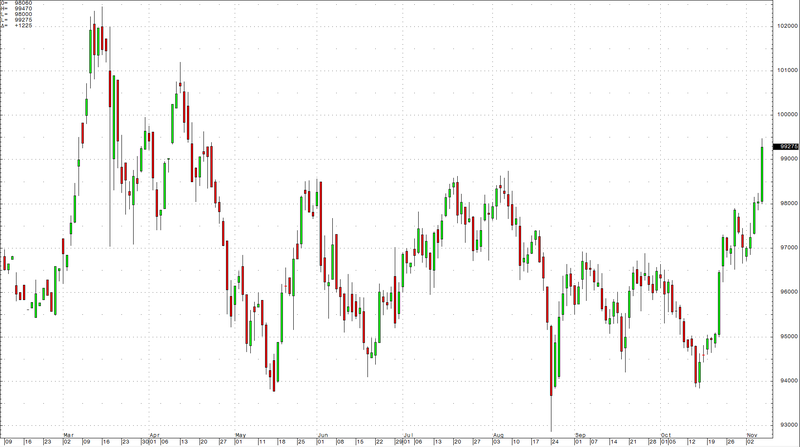 I have been writing for quite some time that my initial target for the currency pair is parity. Aside from Europe's travails, which are bullish for the dollar and bearish for euros, the employment data released last Friday was better than expected. This gives the Fed one more reason to raise the Fed Funds rate in December. With higher interest rates in the U.S. and lower rates in Europe, the dollar becomes even more attractive than it presently is. A long dollar, short euro trade pays interest while you wait for what appears to be inevitable capital appreciation by virtue of the trend of each currency. Meanwhile, the stronger dollar is bad news for gold bulls given the inverse historical relationship between the two. There are more reasons to be bearish gold these days than just the dollar appreciation. I read an article on Seeking Alpha last Friday entitled Why You Should Ignore The Gold/Silver Ratio. The author argues that this historical relationship is nonsense. While there are certainly arguments on both sides, I believe that one ignores historical relationships between commodity prices within the same sector at their own peril. While the long-term average of this relationship over the past four-plus decades is 55:1 or 55 ounces of silver value in each ounce of gold value, it closed on Friday at the 73.8:1 level. I have noticed over my years of trading in the precious metals markets that this relationship tends to revert to the mean over the long term. However, over the shorter term, it tends to signal bear market conditions in precious metals when it is above the mean and bull market conditions when it is below. This is because silver is a more volatile and speculative metal, and it tends to attract speculative interest during bull market periods and very little on the downside. Additionally, the current steep discount of platinum under gold of around $146 as of last Friday also provides a signal for the precious metals sector. Platinum is ten times rarer than gold, and it has more industrial applications on a per ounce produced basis. 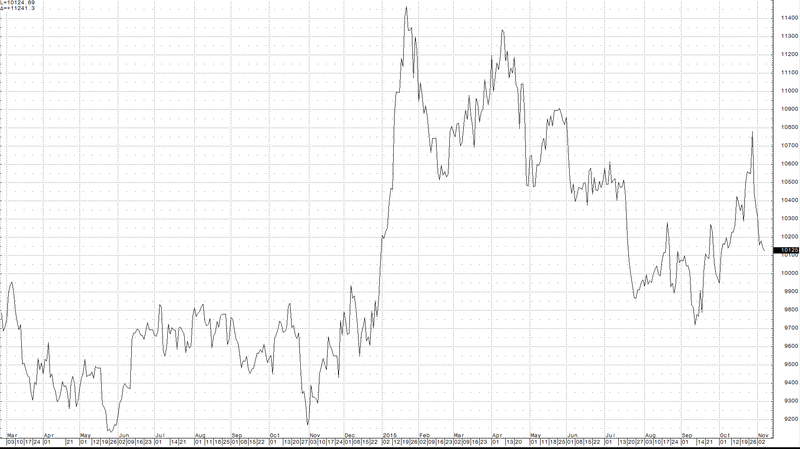 Therefore, it makes sense that platinum has historically traded at a premium to gold. The current discount is yet another piece of evidence that gold is expensive relative to other precious metal prices at its current price. 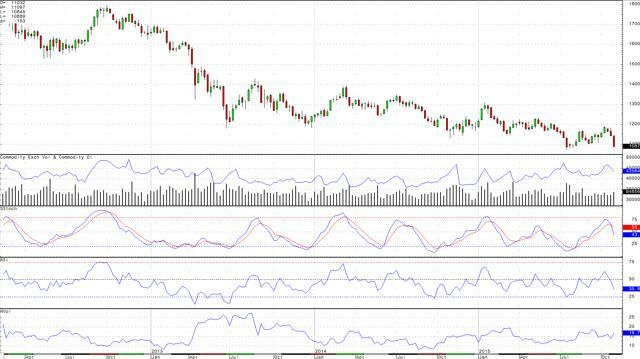 Moreover, recent technical action in gold is bearish. Open interest in gold has declined as gold has moved lower, but it is still almost 20,000 contracts above the level on September 30. This suggests to me that there may still be stale longs who bought on the recent rally waiting and hoping that the price of the yellow metal turns around and moves higher. I do not think that there is enough short interest in the gold futures market at this time to trigger a short-covering rally. Besides, the trajectory of gold is clearly lower. The weekly chart of COMEX gold futures illustrates that momentum in gold is lower as the slow stochastic crossed to the downside on October 26. Last week gold moved aggressively lower, but the prior week it put in a bearish key-reversal trading pattern on the weekly chart. This past week, it simply followed through and validated the bearish technical signal. Relative strength does not indicate an oversold condition, which tells me that gold has more room on the downside as we approach key support, the July lows at $1072.30 per ounce. Finally, historical volatility in weekly gold has increased to 16.7%. Gold historical volatility tends to move lower during times of appreciation and increase during times of bear market action. I therefore believe that all of the ingredients are currently in the gold market for a new multi-year low. My target for gold remains $880 per ounce, which is right around the high price it traded to in 1980. While we may not get there in the next move lower and it may take some time, gold failed again when it could not breach the $1200 level in mid-October. Gold has been making lower highs and lower lows since 2011, and the recent bullish move turned out to be a continuation of bear market action. Meanwhile, I suspect that Stan Druckenmiller will get the dollar versus euro bet right in a big way. I just hope for his sake that he has a bigger position in the currencies than he has in gold so he can cover his losses and make some money. As a bonus, I have prepared a video on my website Commodix that provides a more in-depth and detailed analysis to illustrate the real value implications and opportunities provided by the current state of the global economy and prospects for the future. The ISIS threat will become global unless it is defeated soon. 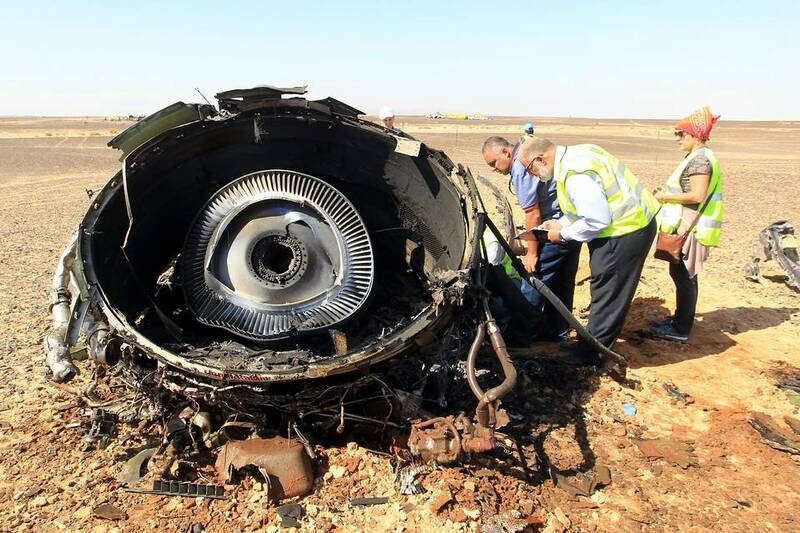 It may be some time before investigators in Egypt can confirm claims by Islamic State (ISIS) that it is responsible for the “downing” last weekend of a Russian passenger jet over the Sinai peninsula, ostensibly in retaliation for Vladimir Putin’s intervention in Syria. Russian commercial carriers have a notorious safety record, and it’s too soon to rule out that a structural or mechanical failure caused the plane to break apart in the sky, killing 224 passengers and crew. Yet by Thursday the weight of evidence was sufficient to persuade David Cameron that it was “more likely than not” that the plane was brought down by “a terrorist bomb,” with President Obama adding that “it is certainly possible that there was a bomb on board.” The British Prime Minister suspended U.K. flights to the resort town of Sharm el Sheikh, stranding thousands of British tourists, and Mr. Putin suspended Russian flights to Egypt on Friday. Mr. Obama’s claim might be an easy sell with the readers of left-wing blogs. It must seem detached from reality to U.S. allies, including Egypt, who find that the outspreading chaos of Syria has now reached them. The Egyptian economy has recovered modestly over the last year thanks largely to a jump in tourism, which accounts for 5% of GDP and more than a million jobs. “The magnitude of the effort needed to secure the needs of 90 million people is huge and beyond any one man’s effort,” Egyptian President Abdel Fattah Al Sisi told us in March. Now it’s become that much bigger. The Egyptian military has been fighting a terrorist insurgency in Sinai for years, turning much of the peninsula into a no-man’s land. In 2014 terrorists shot down an Egyptian military helicopter with a surface-to-air missile. In July they hit an Egyptian patrol ship using a guided missile. In September four U.S. troops serving with a multinational peacekeeping mission in Sinai were injured when two improvised explosive devices hit their convoy. Nearly 300 Egyptian soldiers and several hundred civilians have been killed in the fighting. Islamic State considers Sinai a “province” from which its fighters—mostly local Bedouins who swore allegiance to ISIS leader Abu Bakr al-Baghdadi last year—can stage attacks against the rest of Egypt, Israel and nearby Saudi Arabia. That’s no small risk, especially considering that Egypt must also contend with Islamic State offshoots on its border with Libya. But the larger danger is ISIS’s growing ability to win the allegiance of geographically distant groups or individuals beyond Syria or Iraq. It is doing so partly through its sophisticated propaganda channels, but mainly by the power of its example. As long as ISIS is in the fight and undefeated by the U.S. or other “apostate regimes,” it becomes a natural pole of radical attraction—the proverbial “strong horse” in the race for ideological sympathy among young Muslims around the world. That’s what makes the Obama Administration’s lackadaisical approach to fighting ISIS so dangerous. Local battlefield reverses such as ISIS’s conquest of Ramadi in May don’t stay local. They amplify a growing Mideast and world perception that the U.S. has no stomach for a real fight and is prepared to tolerate the existence of Islamic State over the long term. The longer ISIS holds large chunks of Iraq and Syria, the stronger its offshoots in Sinai, Afghanistan, North Africa and elsewhere will grow. The greatest folly of the Administration’s Mideast policy has been to imagine that an arms-length approach to the region’s troubles would keep its problems away from us. But as with the refugee crisis in Europe, or ISIS-inspired jihadist attacks in the U.S., the tragedy in Sinai is another reminder that trying to downplay the threat of terrorism only brings its risks closer to home. Crony capitalism wasn’t true capitalism when it infected the Philippines in the 1980s, and it is not in the U.S. either, writes George M. Taber — who is credited with inventing the term — in this opinion piece. Taber is a former business editor of Time magazine and the founder of weekly newspaper NJBIZ. He is also the author of Chasing Gold: The Incredible Story of How the Nazis Stole Europe’s Bullion. Every time I see the words “crony capitalism,” as I did recently in a newspaper’s editorial and a news story, I smile to myself, because I invented the term. I was the business editor of Time magazine for much of the 1980s. One of my jobs, early on Saturday mornings when the publication went to press, was to write the headlines. In early 1980, I had a particular interest in a story about the Philippine economy. It had been reported by Sandy Burton, one of Time’s best foreign correspondents, who was a veteran in covering that troubled country following the assassination of opposition leader Benigno “Ninoy” Aquino. She sent an excellent report on the country’s sluggish economy and the corruption-dominated business community fostered by President Ferdinand Marcos. Burton reported that his business associates were his cronies, and that sweetheart deals were the norm. The Philippines was a nominally capitalist country, but these cronies dominated the economy through insider deals and lived in splendor. At the time and still today, I had a great interest in capitalism as an economic system. In late 1979 and early 1980, I spent weeks researching and writing a special Time cover story entitled, “Capitalism: Is It Working?” The impetus for the story was the stagflation and energy crises that burdened the U.S. in the late 1970s. The idea was proposed by Henry Grunwald, the editor-in-chief of Time Inc. and an intellectual with an outstanding reputation. I had the unusual luxury (even for those days) of researching the topic for nearly two months, which included long hours at the library of Princeton University, which was near where I lived. I also had a small mountain of reports from Time correspondents around the world that included interviews with some of the world’s leading economists and historians. The story ended up running twice as long as a normal cover. The answer to the question, not surprisingly, was that capitalism could still work, but it had to function properly and get its basic principles right. John DeMott, a veteran Time writer, wrote the story, and did a good job, and I edited it. But as I read the reports from Burton, I was struck by the Philippine distortion of the capitalist system. This was not capitalism. It was a weird distortion of the free market that benefited a few and kept the masses in poverty. The cronies got rich, and the poor stayed poor. So early that morning I wrote the headline: “A Case of Crony Capitalism.” I have always been a sucker for alliteration. The article appeared in the issue of April 21, 1980. I didn’t think much about the title for years until one day in early 1998, when I received a telephone call from a New York Times research assistant working for William Safire. Safire wrote a celebrated and erudite Sunday column about language. He often recounted the origin of new words or slogans entering English usage. His assistant said that she had done a study and found that the first time crony capitalism had been used was in that Time story of mine. I explained how it came to be (as outlined above), and in his column of February 1, 1998 Safire recounted its origin and more. Unfortunately, the Philippine economy today is still stuck in a morass of crony capitalism. And a similar cozy relationship between big business and government politicians has, unfortunately, developed in the United States. Both Republications and Democrats are guilty of sweetheart inside dealings that pay off political donors, who are usually spending corporate funds to buy favors and distort a free economy. Washington is flooded with lobbyists trying to make their special deals, and at times it seems as if lobbying is the nation’s major growth area. Crony capitalism wasn’t true capitalism in Philippines, and it is not in this country either. So when I see my phrase in the papers I don’t just smile. I wince as well, as I regret the state of affairs that prevails around us. PARIS – Forget principles and morality. Forget, or try to forget, the quarter-million deaths for which Bashar al-Assad is responsible, directly or indirectly, since choosing to respond with violence to a peaceful uprising of the Syrian people. Set aside the fact that Assad’s forces have caused 10-15 times more civilian deaths thus far than the Islamic State, whose horrific execution videos have overshadowed the Syrian dictator’s invisible massacres. But even if you can purge all of this from your thoughts, a policy for Syria that posits Assad as an “alternative” to the Islamic State is simply not viable. Assad, after all, literally unleashed the Islamic State’s current savagery: in May 2011, he released hundreds of Islamic radicals from prison, quickly supplying the infant group with fighters and leaders. He then methodically shelled positions held by moderate rebels, while no less methodically sparing the Islamic State’s stronghold in Raqqa. And then, in mid-2014, he allowed Iraqi elements of the Islamic State to find sanctuary in eastern Syria. In other words, Assad created the monster that he is now pretending to fight. Is all that not a little much for a potential ally? Can working with Assad possibly provide a sound basis for what is supposed to be a common effort? The bottom line is that Assad has no interest in winning. The man who now holds himself up as civilization’s last bulwark against the Islamic State is also the last man who wants to see it eliminated. After all, does a chess player, even a bad one, intentionally sacrifice his most powerful piece? Do any of us ever tear up our insurance policies? Do we really believe that Assad and his cronies are too stupid to have realized that their political survival depends on that of the Islamic State and on maintaining themselves as the keepers of the gate through which the rest of us must pass to wage war against it? But this, too, assumes that dictators are more stupid than they really are. Worse, it ignores that politics follows its own logic, or at least its own dynamics. What the sorcerer’s apprentices who want to work with Assad ignore is that they would most likely have a great deal of trouble, when the time comes, distancing themselves from an ally who would not be shy about claiming his share of the victory. As a result, jihadism would rush back in, though perhaps in a different guise. “Bashar al-Assad is the Syrian state,” the same people say. “And we must not commit the fatal error of destroying the state.” But this argument is not valid, either. The state has already failed: Assad's regime controls only a fifth of Syria’s territory, and the remaining four-fifths will never willingly resubmit to its terrifying control. If the regime prevails, Syria’s citizens will continue to flee in droves to Turkey, Lebanon, and Europe. In fact, Assad’s regime cares so little for its pseudo-state that it abandons its own soldiers caught beyond the territory it controls, as occurred in Tabqa, near Raqqa. Baathist Syria, whatever its friends in the Kremlin and elsewhere say, is dead and buried. And no military trompe l’œil can revive it. But the supposed realists refuse to accept reality. Just as it was necessary to ally with Stalin to defeat Hitler, they claim, we should not be afraid to play the Assad card to rid ourselves of the Islamic State. Yes, jihadism is the fascism of our day, infected with plans, ideas, and a will to purity comparable to those of the Nazis. I was one of the first to suggest the comparison some 20 years ago. And yet it is absurd to compare the power of the two phenomena, or to suggest that in the confrontation with the butchers of Mosul and Palmyra, the democracies face a strategic challenge analogous to that of the Nazi Wehrmacht. This historical leap is possible only for people whose political irresponsibility is matched by their proclivity for lazy analogy. Make no mistake: the Islamic State is strong. But it is not so strong as to leave those who would fight it with only the politics of the lesser of two evils. The West must decide what to do. In the aftermath of last week’s peace talks in Vienna – which convened the United States, Russia, Iran, China, Egypt, Turkey, Saudi Arabia and other Gulf states, Jordan, Lebanon, and key European Union members – that question becomes increasingly difficult. Should we equip what remains of the Free Syrian Army? Should we deal with the few remaining Alawite leaders whose hands are not stained with blood, or those members of Assad’s clan who chose exile early and thus were not involved in the massacres? Perhaps there is still time to bring together, on neutral ground, some of the elements that comprised the old Syria. Or perhaps more radical solutions – of the type implemented in Germany and Japan after World War II – are now required. All of these paths remain open, but they are narrowing. And none of them depends on the political survival of Bashar al-Assad.